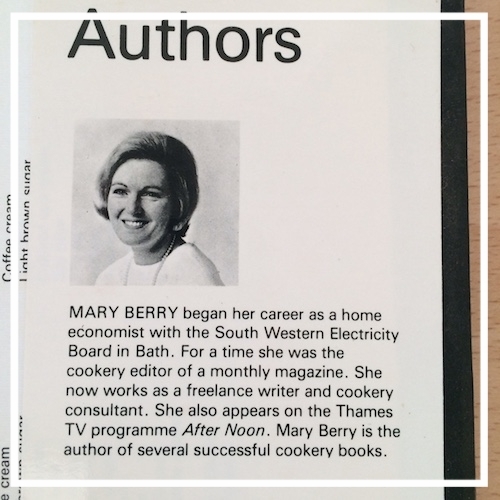 Around the time when I was finding my feet – two left ones, as it happens – in secondary school, my sister Cathy brought home a copy of the Hamlyn All Colour Cook Book, co-authored by a fresh-faced Mary Berry. This was the book that ushered what we thought of as the futuristc food of the 1970s – at least for those of us living in Ireland and Britain. The copy I now have is not, alas, the dog-eared original; I don’t know who got that when my parents’ house was sold. Mine is the nineteenth impression, published in 1980 with the proud claim “Over 1,500,000 copies sold” flashed on the dust jacket. By 1980, I suspect it was becoming a little old-fashioned. I can’t claim to use it these days; it’s more a source of nostalgia, and I was convinced, until today, that there is no mention at all of garlic in it. This is not true. In recipe 10 (there are no page numbers) which is for roast lamb lyonnaise (sic) there is a call for 1 or (hold on to your hats!) 2 cloves of garlic. While some garlic is compulsory with the lamb, I see that Spaghetti bolognese (you see the fashionable typesetting there? Lower case b) includes a rather half-hearted “1 clove garlic (optional)”. Italian veal has to struggle on sans garlic, as does, bizarrely, Boeuf bourguignonne (sic), which calls for “¼ pint cheap red wine” and that Burgundian staple, “½ level teaspoon dried mixed herbs”. Kipper and egg flan does not look quite as bad as it sounds (recipe number 187), which is an achievement in itself, and there’s “Monday pie” (219) which is a cunningly renamed shepherd’s pie. 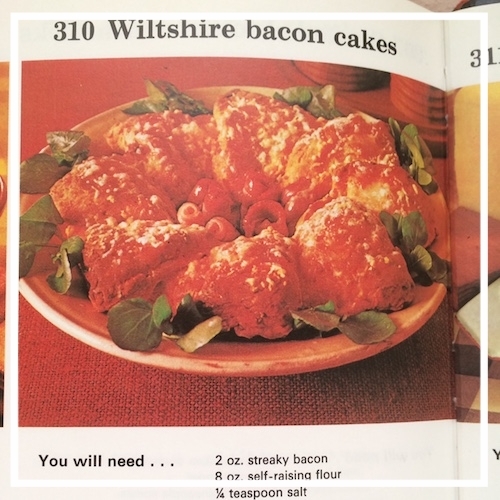 Mind you, I still make a version of Cheesy leeks and ham (311) and I remember fondly Wiltshire bacon cakes (310) which, I suspect, don’t have a lot to do with that pleasant county by the M4. When I bought my mint condition copy of this milestone book, I searched frantically for eggs mornay. This was a regular dish at home circa 1974 and, well, there it wasn’t. And then I remembered. The recipe was in a booklet of rather more sophisticated recipes (well, they purported to be French, dammit) bought by the same dear sister, Cathy. Being French, the recipe for eggs mornay did not involve the killer ingredient, the ace flourish which either Cathy or my mother or possibly somebody else came up with: crushed potato crisps. And, of course, in those days, this meant only one thing. Tayto Cheese and Onion. These, combined with Cheddar cheese, formed the crunchy thatch on top of the creamy, bubbling sauce that blanketed the halved hard-boiled eggs. I forgot about this fabulous combination of store cupboard ingredients (our larder is rarely without a bag or two of crisps as they go so well with fino sherry when we run out of olives) until recently. I got a sudden yearning for its simple but compellingly delicious, comforting taste and textures. So, I recreated it as best I could. The Worcestershire Sauce (Lea and Perrins, natch) is something my mother added occasionally. She added it to a lot of things, almost invariably with encouraging results. I urge you to do the same; it is a kind of culinary elixir and its story is fascinating, even if it must wait for another day. I was so anxious to get this dish made that I forgot to take a picture of the result. It looked, to be frank, much as you would expect. I had a look on Google images to see if I could borrow a photo but, bizarrely, eggs mornay seems to hold the record as the dish of which the most unpleasant photographs have ever been taken. Have a look, but brace yourself. First things first. Set the oven to 180ºC, gas mark 5. Boil the eggs for 10 minutes, let them stand off the heat for 2 minutes, then drain and cover with cold water. After five minutes, drain again and cover with cold water. You want your eggs to be properly hardboiled, not faintly runny in the middle. Well, I do, anyway. Hardboiled eggs should be hardboiled. Otherwise, what’s the point? Melt the butter in a saucepan and stir in the flour. Cook the flour over a gentle heat for 1 to 2 minutes, then take off the heat and start to whisk in the milk, a splash at a time. It’s definitely better to whisk than to stir, as this simple expedient will minimise the risk of lumps developing. When most of the milk has been added, return to the heat and turn it up. Continue whisking, and add the rest of the milk. When the mixture has thickened, add two thirds of the grated cheese, the mustard powder and the Worcestershire sauce. Stir until the cheese has melted, then whisk to ensure that all is smooth. Add salt and pepper to taste. I should probably add, at this stage, I have a theory that’s it’s impossible to add too much cheese. I may be wrong. Anyway, now shell and halve the eggs. Take a large, shallow over-proof dish and spread the eggs, cut side down, in it. Pour the cheese sauce over the eggs. Now take the crisp packets and, without opening them (this is important! ), bash the contents with your fist until reduced to small fragments. The crisps should look as if they have been in the bottom of a rucksack for much of the Camino. Spread the bashed crisps evenly over the surface of the cheese sauce, then sprinkle on the remaining one third of the cheese and bake for 20 minutes or until the top is golden and the sauce starting to bubble.